We know that sound travels. How fast does it travel? Sound travels about 1500 meters per second in seawater. That’s approximately 15 football fields end-to-end in one second. Sound travels much more slowly in air, at about 340 meters per second, only 3 football fields a second. Unfortunately, the answer is really not quite that simple. The speed of sound in seawater is not a constant value. It varies by a small amount (a few percent) from place to place, season to season, morning to evening, and with water depth. Although the variations in the speed of sound are not large, they have important effects on how sound travels in the ocean. What makes the sound speed change? It is affected by the oceanographic variables of temperature, salinity, and pressure. We can look at the effect of each of these variables on the sound speed by focusing on one spot in the ocean. When oceanographers look at the change of an oceanographic variable with water depth, they call it a profile. Here we will examine the temperature profile, the salinity profile, and the pressure profile. Similar to the profile of your face that gives a side view of your face, an oceanographic profile gives you a side view of the ocean at that location from top to bottom. It looks at how that characteristic of the ocean changes as you go from the sea surface straight down to the seafloor. The spot we are going to explore is in the middle of the deep ocean. Here are basic profiles for a site in the deep, open ocean roughly half-way between the equator and the North or South pole. In these profiles, temperature decreases as the water gets deeper while salinity and pressure increase with water depth. Here we are referring to the ocean pressure due to the weight of the overlying water (equilibrium pressure), not to the pressure associated with a sound wave, which is much, much smaller. In general, temperature usually decreases with depth, salinity can either increase or decrease with depth, and pressure always increases with depth. Depth profiles from the open ocean of temperature, salinity and density. Copyright University of Rhode Island. From these profiles, it can be seen that temperature changes a large amount, decreasing from 20 degrees Celsius (°C) near the surface in mid-latitudes to 2 degrees Celsius (°C) near the bottom of the ocean. On the other hand, salinity changes by only a small amount, from 34 to 35 Practical Salinity Units (PSU), approximately 34 to 35 parts per thousand (ppt). Finally, pressure increases by a large amount, from 0 at the surface to 500 atmospheres (atm) at the bottom. Here is a typical sound speed profile for the deep, open ocean in mid-latitudes. 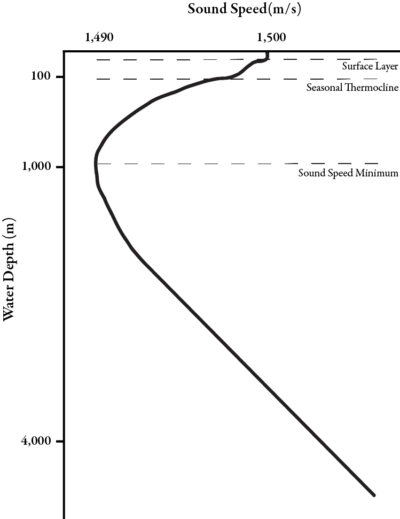 Profile of speed of sound in water. Note the sound speed minimum at 1000 meters. Copyright University of Rhode Island. The decrease in sound speed near the surface is due to decreasing temperature. The sound speed at the surface is fast because the temperature is high from the sun warming the upper layers of the ocean. As the depth increases, the temperature gets colder and colder until it reaches a nearly constant value. Since the temperature is now constant, the pressure of the water has the largest effect on sound speed. Because pressure increases with depth, sound speed increases with depth. Salinity has a much smaller effect on sound speed than temperature or pressure at most locations in the ocean. This is because the effect of salinity on sound speed is small and salinity changes in the open ocean are small. Near shore and in estuaries, where the salinity varies greatly, salinity can have a more important effect on the speed of sound in water. It is important to understand that the way sound travels is very much dependent on the conditions of the ocean. 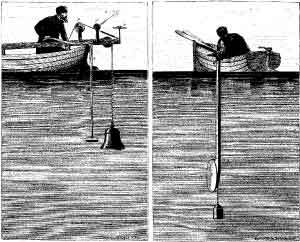 The sound speed minimum at roughly 1000 meter depth in mid-latitudes creates a sound channel that lets sound travel long distances in the ocean. The SOFAR Channel Section provides more information on how the sound speed minimum focuses sound waves into the channel.